One of the best parts of Silent Roar, filmmaker Hugh Miles’ documentary on the snow leopard, is a shot of a leopard hunting in the highlands of northern India. The leopard, slyly working his way across a cliff face, reaches a small ledge and crouches in silence. The camera zooms in on a large bharal (Himalayan blue sheep) innocuously feeding on small scrub. The suspense builds as the black-spotted leopard, a quick and determined killer, positions himself perfectly for the attack. And then it happens. As the bharal takes a step, the leopard lunges from his perch and chases the unfortunate prey down the precipitous slope. It’s a beautiful, fluid movement: the leopard’s body flexes and gleams in the sun, his legs pumping like they’re on fire. Silent Roar, made in 2005, included both the first footage of a snow leopard hunting and the first footage of snow leopards mating. You would think that the leopards are prime subjects for documentaries- they’re elegant, fiery, mysterious creatures. But there’s a problem- there are very few left. The threats to the species, which is officially endangered, come primarily from humans. The leopards’ pelts and bones are highly prized for clothing, rugs, and traditional medicine, making the animals prime targets for poachers. Many nomadic herders, in addition, see snow leopards as pests. The leopards can kill 30-50 sheep at a time, which is an economic catastrophe for nomads with already precarious lives. The nomads respond by poisoning or shooting the predators. But part of the leopard’s aggressiveness is caused by the same people that hate the animals’ feisty nature. 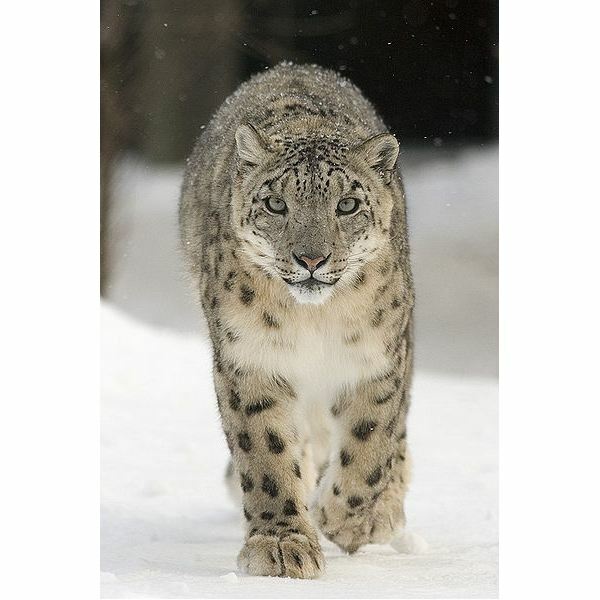 Snow leopards are solitary animals that need lots of space. A typical leopard needs about 40 square kilometers for hunting, mating, caring for cubs, and, eventually, dying. Over the past century, humans have encroached into wilderness areas, severely limiting the space available for snow leopards. In a way, it’s like your worst enemy moving into your attic. In addition to needing plenty of space, snow leopards need prey-rich land. It doesn’t help matters that many of their traditional targets, like the argali sheep or the markhor goat, are also threatened or endangered. If there is little prey in a leopard’s territory, he will keep expanding his land until there is enough. “Home base” ranges for prey-poor areas range from about 200 to 300 square kilometers, or five to six times the size of ranges with sufficient prey. Between poaching and human encroachment, the future does not look bright. But there are a few lights on the horizon. About fifteen large parks in Asia have been set aside as snow leopard refuges, and over 600 leopards are kept in zoos around the world. Recently, researchers invented a new livestock corral for Himalayan herders that keeps leopards out. But these measures will do little without a change in attitude. The human denizens of Central Asia have long thought of the snow leopard as a deadly enemy to be removed from their world. But conservation organizations like the Snow Leopard Trust have worked to foster appreciation for the magnificent creatures. Rodney Jackson, one of the top snow leopard researchers in the world, notes that villagers who once despised the leopards now call them the “ornaments of the mountains”. It’s an understatement, but also a beacon of hope for this powerful yet fragile animal. PBS: Silent Roar: Searching for the Snow Leopard. Documentary filmed by Hugh Miles and Mitchell Kelly. Misra, Julie "Saving the snow leopard." The E:Environmental Magazine (May-June 2005). "Population and Protections". Snow Leopard Trust (2008). Retrieved on 2008-11-12.